In the Dutch Renault forum, the issue came up that the maximum regenerative power allowed is higher than what CanZE reports as the Max battery charge / regen kW power. Based on a few experiments of my own only, it seems the Zoe will allow double the reported power for regeneration, capped at 40 kW DC of course. After all, it is supposed to be a short burst and the amount of energy, by definition, has already been taken from the battery. I would appreciate your findings. Just open CanZE on the driving screen and whenever the Max battery charge / regen kW is substantially below 20 kW, try to do a serious regenerative brake (from a high speed works best, i.e. a motorway exit) and see how far the DC Power kW (or if it refreshes too slow, the blue kW in the dash) shows please. Thank you! Edit: based on my own testing it seems there is indeed a short over-power possible. The rough formula is max_charge_power * 1.65 + 3.5. More testing by Borut suggests this seems sustainable for either roughly 40 seconds, or until the total battery voltage reaches 390 volts (4.06 volts per cell), see the comments. It should be possible to calculate the max regen power by taking the max_regen_torque (the blue bar in the driving and consumption screen) and multiply that by the wheel speed (in rad/sec). I might implement this in a test screen. Yes, I see this every day. The max blue power on the dash is always higher than max regen on CanZE. I would not say double the value, but a few kW. The max/regen/charge power is calculated by the battery computer ,but the regen charger work simply by constant power(40kw) or constant voltage(390 V) . Try loking at the battery voltage, it is always at 390 or below so the battery charger send as much power as it can to the battery until one of the criteria is meet(40kw or 390V and only then start’s to cap the power. On the other hand ,I live uphill and when I drive down , the observed double regen power is there for a couple of seconds and after that the regen power is exactly as the canZE shows. at the end on the hard brake the blue indicator shows +5 kw. So, the 390 volts seems to be the “trigger” indeed. Learned something new today! After the some time, the value is recovering slowly. It stays on this value. Then charging stoped. Max Charge rises within 15 seconds to 8.2kW. After Charging Start, same story again, value decreases to 6kW. Specially for charging it is a bit puzzling since it seams to self limit the charge power even further, which is not very nice for charging the R90. But for regeneration I did not find a limitation yet. I’ll test again with 95% SOC, there the limitation should kick in since my downhill will regenerate around 3%SOC. 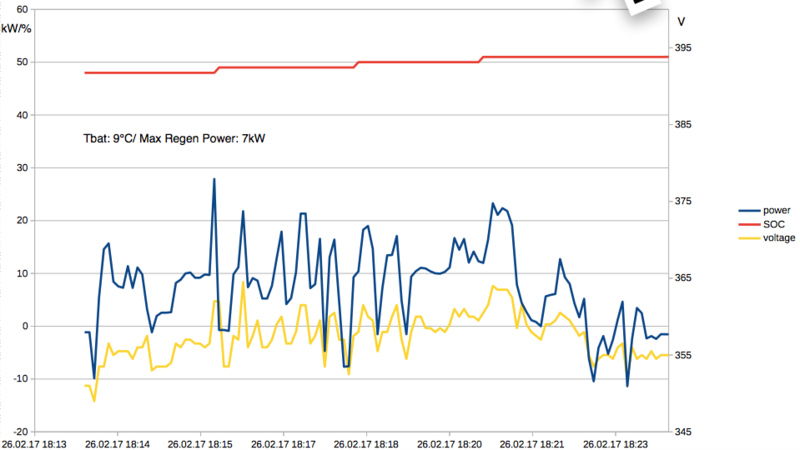 From testing so far I can see 25kW Regen with 4.1kW of Max Charge, which does not match with the Formula stated above. Again, on a R90. 4 degrees centigrade / SOC 50% on the old battery would allow a charging rate of roughly 0.5C (11 kW, 2 hours charging). 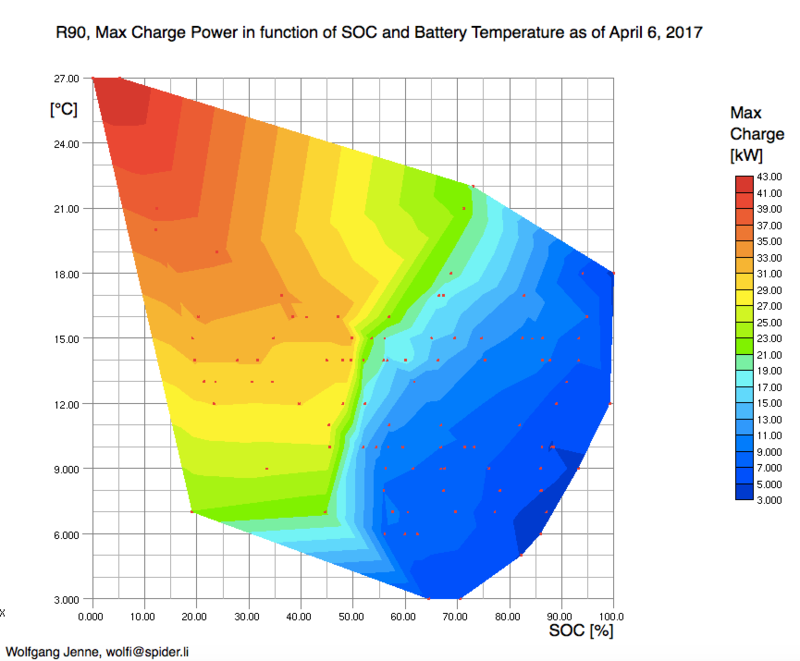 0.5C on a 40kWh battery of roughly the same chemistry would allow 20 kW…….. I am already hearing the 90 models are closer to the 2×0’s in charging power (in kW) limits (as opposed to charging rate in C’s). This makes totally no sense to me, especially if the regen is so high as you report. Could you maybe check with the wallbox if the real power taken maches roughly the Max Charge Regen? 70% – 17.0 kW – 19°C – Then I stopped charging. Before the charging (after Highway), the Max Charge Power was 29.1kW. As soon charging began, the Battery Power always matched the Max Charge Power +/- 0.3kW. The public charger does not give me Power, but it shows the Energy and time. It was in that time 14.2kWh within 44 Minutes which equals to 19kW average Power which would match too. At these temperatures, charging is ok as well. Sorry for not noticing and approving your comment earlier…. So, the conclusion is that for the model 90’s, battery throttling is well underway (down to 18 kW) @ 48% SOCu and 16°C, whereas it should be able to go up to 40 kW under ideal circumstances (which is already half of the 2×0 models, given the [nearly] double size of the battery). I am really confused about this, as the 2×0 models only start throttling back from 40kW (=2C) at this point and the 90 models seems to be throttling back to below 20 kW (=0.5C) at the same SOC/temperature point. In other words, the model 90 battery seems to be much, much more delicately handled by the BMS, and therefor much much less willing to charge at full power. This would limit IMHO the added value of a Q90 (compared to an R90) significantly. Thank you for this data! Yes, it is very confusing. The odd thing is that the new models are allowing much higher regen values at the same time which is in contradiction to the charging behavior. I assume there will be an software update in the future. I also gave this feedback to my dealer. He promised me to ask Renault about that. so based on this two (non scientific) observations the charging power is depending on the Start-SOC Value and the Temperature. It is so weird. Another R90 driver observed the same thing, therefore I think I can post this here without getting declared as completely nuts. Since we discussed, I was occasionally recording SOC/Temp/Max Charge Values of my R90. The result of the so far 100 points you find below. The values are really used when charging, but are sometimes a little lower since the Max Charge Power seams also to depend on the actual DC Power to the battery. However, I am not able to define much more to this observation. So far, with this diagram, all the charging curves can be explained. So having a very long “over the spec” charging cycle, the Zoe was actually cooling down the battery from 26°C to 18°C, thus extending the charge above approx. 55% SOC. In another charge, the spec was reached, there, the charging started @14°C and ended @26°C without actual cooling (as far as I can tell). For more information, heres a graph from a recent downhill ride with my R90. Temperature of the battery was about 9°C, Max Regen Power before the ride was 9kW, during the ride it went down to about 7kW.